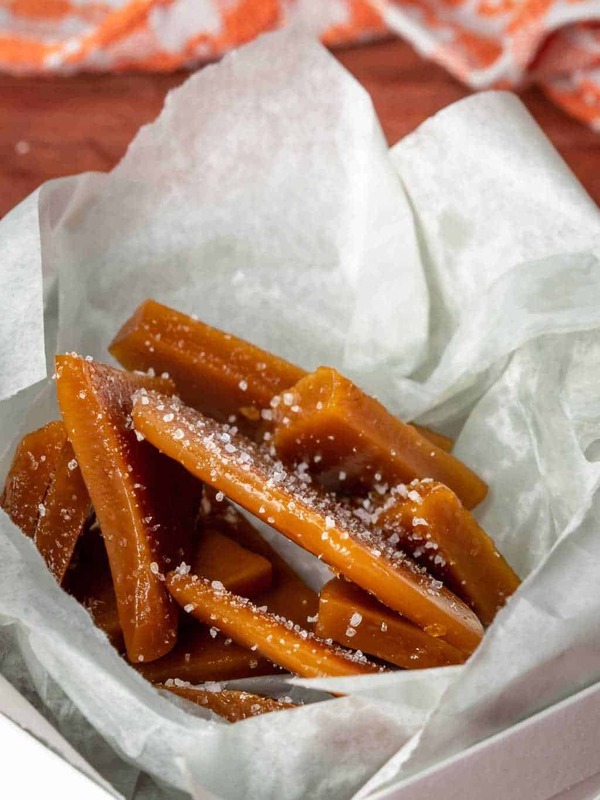 Traditional butterscotch candy is a type of sweet consisting primarily of brown sugar and butter. Like most modern candies, the mixture normally includes corn syrup. Some variations also include vanilla extract, cream, molasses, and salt. Hint: two of the four ingredients in this recipe are vanilla extract and salt. 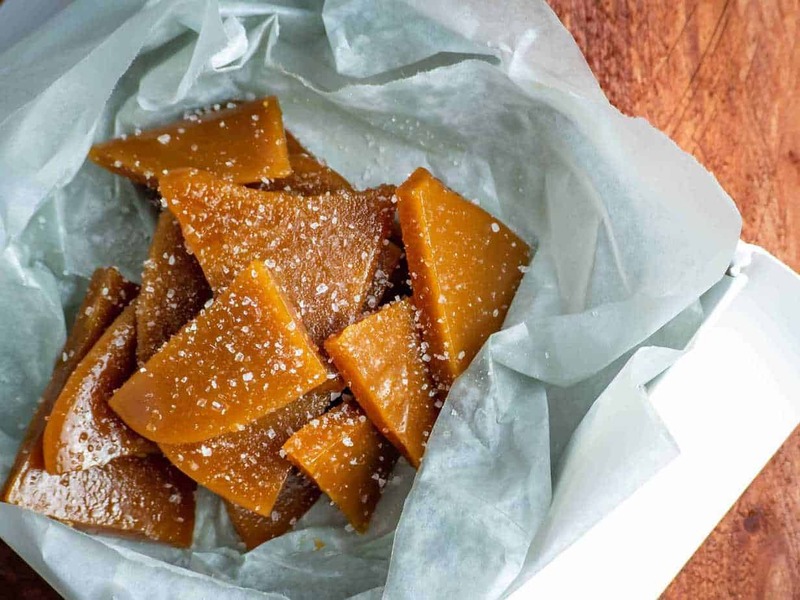 Butterscotch is similar to toffee, but is not hardened to the same point toffee is. By adding cream to the mixture, you can even create a liquid butterscotch topping for ice creams and other sweets. The term butterscotch is also often used more specifically of the flavor of brown sugar and butter together even if the actual confection butterscotch is not involved, such as in butterscotch pudding. That’s it! It really can’t get much simpler than that! Begin by adding the butter to a heavy bottom saucepan and melt over medium heat. After the butter has melted, add the sweetener and stir constantly. And truly, we do mean to constantly. Make plans to stand at the stove with this recipe until it is finished. Bring the mixture a low boil and stir, stir, stir. If the mixture reaches much more than a gradual boil, reduce heat slightly. Stir until mixture reaches a nice, dark amber brown color. Remove from heat and stir in vanilla and salt. Let cool for 3 minutes, stirring occasionally to keep any butter solids from sneaking to the bottom. Pour into an 8 x 8 glass storage container (or similar) and refrigerate overnight, or for at least 8 hours. The mixture will harden, but be easy enough to break. You might notice the mixture will have a slightly grainy appearance, but this will not translate to the overall texture when eating. This is due to the hardening of the monk fruit sweetener as it cools. Break into pieces, devour, and savor! 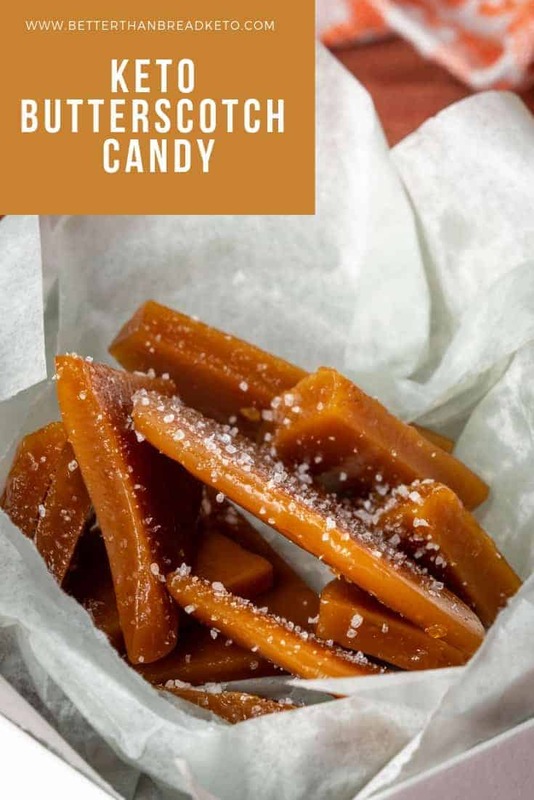 Storing keto butterscotch candy is incredibly easy. Below are some instructions on how to store it, along with a note about storage limits on this recipe. Let’s begin by defining short-term as three days or less. In this case, if you are planning on having the candy around for three days or less, storage can be done in an air-tight container at room temperature. If space allows, refrigerated storage is preferred as a safeguard. However, either one can be used when keeping the candy for this length of time. Do keep in mind, the candy will not be as hard as it would be if refrigerated. We will define long-term storage as three to seven days. If storing your butterscotch candy for this amount of time, store in an air-tight container in the refrigerator. This will ensure the candy will keep for several days without a problem. Even when refrigerating this keto butterscotch candy, it is best not to keep the candy for more than seven days (one week). While storing it for longer periods is possible, it is best to be safe and discard any candy leftover at the end of this time frame. If you find making the full recipe results in too much going to waste after a week, cutting the recipe in half will give the same taste result. You also won’t have as much to store! IS BUTTERSCOTCH THE SAME THING AS CARAMEL? In taste, they are similar, but in preparation they are different. What is the difference you may ask? Well, it’s pretty subtle. The difference in the two is the sugar used to make them. Caramel is made with regular white sugar. Butterscotch on the other hand, is made with brown sugar. While that might not seem like a huge deal, the difference in the two sugars is enough to differentiate caramel and butterscotch. Even in the world of low-carb and keto, we can still create two different flavors by utilizing different sweeteners. If you take a look at our Keto Caramel Sauce, you can see that it uses Lakanto Classic sweetener, while this keto butterscotch uses Lakanto Golden sweetener. WHAT IF IT LOOKS GRAINY AFTER COOLING? As mentioned above, a grainy appearance after the mixture cools is completely normal. The monk fruit sweetener recommended in the recipe will harden back into its original state and can lead to this appearance. However, this does not change the taste of the candy. This grittiness will also not translate to the mouth when eating the candy. Instead, it will have a nice smooth “melt in your mouth” quality to it. If you are going to use a sweetener of your choice, which we discuss below, you might not experience this same grainy/gritty appearance. If you’d like to add a nice element of salty to your sweet, lightly salt the top of the candy with kosher salt before it cools completely. This allows for the salt to not soak into the mixture, but remain at the top for taste. 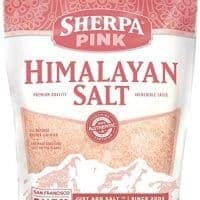 You can use other salts, but kosher salt is best since it is larger pieces and will add not only a flavor profile but also a nice visual element as well. Always remember, adding salt to a recipe isn’t simply adding salt… It’s all about bringing out the flavors the recipe intends! As with almost all of our recipes that require sweetener, we recommend using monk fruit sweetener with this recipe. 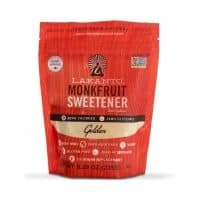 In fact, using Lakanto Golden Monk Fruit Sweetener is one of the best options, as it gives a nice brown sugar taste, all while being able to be heated and not change the taste. There are, however, other sweetener options on the market. Most notably, there are several new brown sugar substitutes that show promise in keto recipes. The goal, of course, is to not spike blood sugar when eating them. If there is a sweetener you prefer more than monk fruit, you are welcome to use it. Keep in mind, each of us is different and react differently to different sweeteners. The other thing to keep in mind is that sweeteners that do not have a brown sugar quality about them may not result in the taste you are aiming for. Each is made differently, but a brown sugar substitute is best when making this recipe. CAN THIS CANDY BE USED IN OTHER SWEETS RECIPES? The short answer is yes, of course. If you’d like to add this candy to a keto ice cream or use it in conjunction with other sweets recipes, please feel free to experiment! If you run across a combination that is absolutely delicious, let us know in the comments below! DOES THIS CANDY MAKE A GOOD DESSERT? Of course it does! 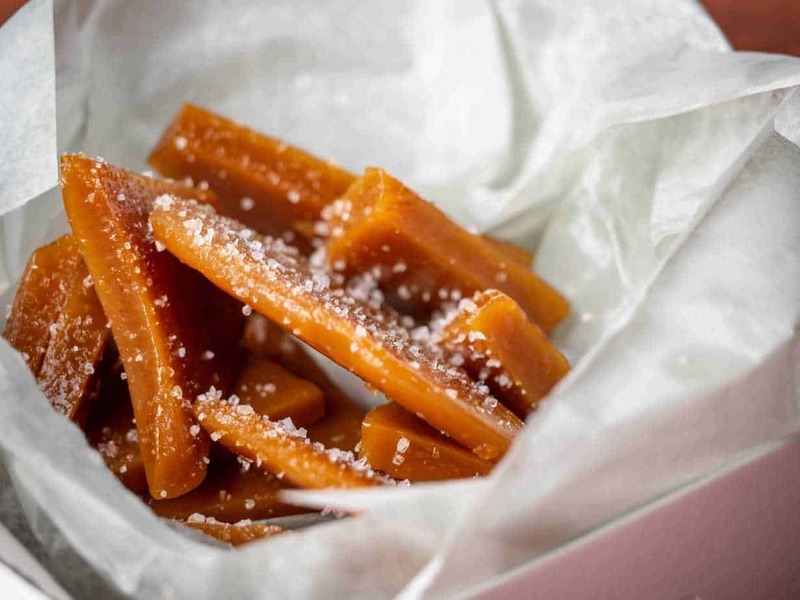 Butterscotch candy is a delicious, sweet dessert for almost any main course. If you’re still looking for some meal ideas, check out our recipe index and more of our main course recipes. Break into pieces and savor! I was wondering if you added in baking soda and stirred and let it set- would it be like a honeycomb? I am not sure about that. Honestly have never heard of doing something like that before. My little girl is on a strict diet due to candida and leaky gut. She has been begging for caramel apples for a while now. I was nervous to make this because she is also allergic to dairy, but the dairy free butter worked just fine! I let it cool a little while stirring it. Then I let her dip apple slices in it. She loved it!! I put it in the fridge to harden and it only thickened. It didn’t crystallize or harden which is ok. She loves it the way it turned out. And she got her caramel apples! Thanks for sharing!! So glad it turned out well for you and your daughter! I had the same problem with the ingredients separating. I skimmed about 1/2 cup of butter off of the top. Perhaps next time the mixture needs to boil more to combine instead of decreasing the heat. I followed the recipe but in my baking experience using traditional sugar these ingredients have to reach a certain temperature and then can be reduced. Or, 1/2 cup butter with the monk fruit sweetener. I am sorry to hear you had trouble. While admittedly I am not a baker, this recipe follows exactly what I did to make it. Having said that, that doesn’t mean I am 100% right on it, but I certainly thought I was 🙁 One thing I do know is that most artificial sweeteners don’t behave the same way as sugar, so prepping it the same way probably won’t work out the same. I made this with Brown Swerve and it turned out great! It’s definitely softer, like a fudge, but SO delicious and easy! Thanks so much!